Praise the Lord. Serbian. Srpsko pravoslavno crkveno pjevačko društvo "Vila" ( Serbian Orthodox Singing Society "Vila") Dirigent: Aljoša Novaković. John Tavener's "The Protecting Veil for Cello and Orchestra"
Thank you to Father Andrew Louth for playing this orchestral music at the conclusion of his three-part lecture on the "Mother of God" at IOCS. Who comes invisibly escorted by the Divine Hosts." Heavenly Aramaic Byzantine Chant - Archimandrite Seraphim Bit-Haribi. The richness of our faith transmitted in a call to the heavenly through Orthodox chant in the Aramaic language. By immersing oneself in this beauty, one strives for inner beauty. Thanks be to God for all living things, for nature and the environment around us. Thanks be to God for giving us breath. May He have mercy on us. And may all the saints intercede for us. Thank you Archimandrite Seraphim Bit-Haribi for showing us glimpses of the eternal. Presvitera Dr Jeannie Constantinou is a beautiful example of an Orthodox Christian teacher. We first had contact some years ago when Dr Constantinou came across MG Michael's thesis at Holy Cross Library on the Apocalypse. See her translation on St Andrew of Caesarea's commentary on the Apocalypse. She is also featured on Ancient Faith Radio. Here is her podcast and some of her interviews are here. I would highly recommend her. Very Reverend Father Josiah Trenham, Ph.D.
Father is the founder and director of Patristic Nectar Publications, a company dedicated to “nourishing the spiritually thirsty with the sweet teachings of the Holy Fathers” in quality audio recordings. PNP produces both recordings of patristic works as well as recordings of lectures and homilies available in direct download formats (www.patristicnectar.org). Father Josiah’s weekly homilies and additional theological reflections are published weekly and listened to by thousands all over the globe on The Arena podcast on Ancient Faith Radio: www.ancientfaith.com/podcasts/thearena. Father serves as an instructor in and on the Board of Advisors of the Ss. Cyril and Athanasius Orthodox Institute in San Francisco: www.sforthodoxinstitute.org. He is an adjunct professor of theology at St. Katherine College in Encinitas, Ca. (2010-present), and was an Adjunct Professor of History at California Baptist University (2003-2010). 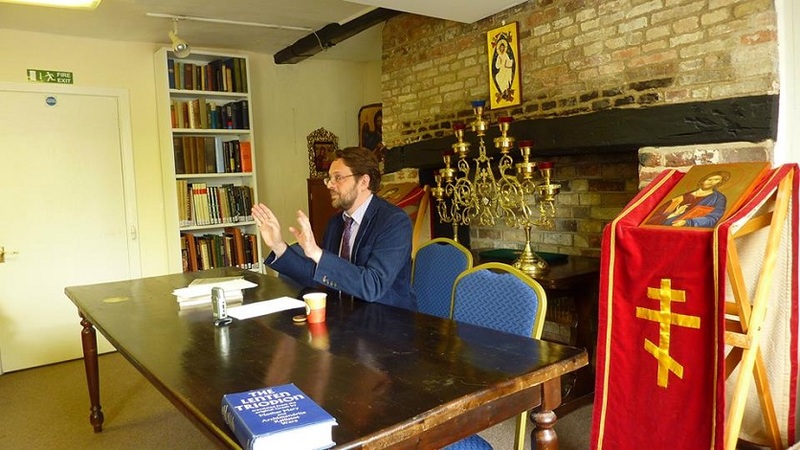 He is a member of the Orthodox Theological Society of America, and participates in yearly academic forums and symposia. Since 2004 he has served on the Mayoral Environmental Committee (GAP) of the City of Riverside. Father Josiah has also served as a member of the Secretariat of the Assembly of Orthodox Bishops in the United States since its inception in May, 2010. Father Josiah was married in 1988, and has ten children. I came across Abbot Typhon in a joint panel he was presenting with Fr. Seraphim Cardoza of St Innocent's Orthodox Church in Oregon. Below are a selection of the Abbot's reflections. Abbot Tryphon was raised Lutheran, then he became a clinical psychologist (both lecturing and in private practice) getting involved in Zen Buddhism during his undergraduate coursework years. Less than a decade later, from what I can deduce from his talks online, he returned to Christ, converting to Eastern Orthodoxy. Abbot Tryphon speaks frankly, from experience, and with grace. He speaks authentically and from the heart with a great sense of humour and warmth. I personally appreciate his fundamental message- we need to embrace all people, and to love all people.